I attended my third Lau family wedding a couple of weeks ago and once again I was startled by how different Hong Kong weddings are from typical American weddings. I realize many people have unconventional weddings and not everyone who gets married has one at all. I’ve been married three times and have never had a church wedding although I did once have the honor of wearing my mother’s handmade satin dress. Thus, it is entirely possible that my views of what constitutes tradition may be a bit skewed. Here is what I think I know from attending and watching standard American weddings. An American wedding invitation states the time of the ceremony and the reception. Guests know to arrive early enough to be seated. The bride is not publically seen in her wedding dress before the ceremony except by her female relations and her bridesmaids. Guests are expected to be quiet during the wedding (unless you are the jilted lover in The Graduate) until the deed is done and the couple is presented to the guests. Professionals take wedding photos discretely during the ceremony. Family and wedding party photos are typically taken after the ceremony and before the reception. Reception photos and videos, like those at the ceremony, are taken unobtrusively by professionals. At the reception, there will be cake shared by the bride and groom and then with the guests. The top layer will be saved and frozen to share on their first anniversary. There is often a receiving line at the entrance or exit. Our end of the day didn’t go according to plan due to a wardrobe malfunction. Not wanting to ride the metro in our wedding guest attire, Fred and I splurged on a taxi from the New Territories to the Landmark Hotel. We decided to use our extra time to hang gai—to walk around and see the Christmas lights, but in the first block Fred said his right foot felt like he was walking at an angle. He lifted his shoe and discovered a chunk of the heel had fallen off. We then made a beeline to Marks and Spencer to look for new shoes, a Hansel and Gretel trail of black polyurethane chunks trailing behind. We lucked into a 60% off sale and a whole shelf in his size. Despite his habit of keeping new shoes in storage before wearing them (and what Ecco claims is the reason for their decomposing soles), this time Fred wore his new footwear out of the store. We made it to the wedding venue five minutes before we had been told to arrive only to discover that we actually had hours to spare. I should have known. In one room, Fred’s parents, aunts, and uncles were playing mahjong. Bridesmaids directed us to sign an oversize photo-book and consult a directory to find our round table in the banquet room. Cousins and friends greeted each other and admired two albums of pre-wedding photos displaying the couple in various settings and in wedding and non-wedding attire. Snacks and people and the groom circulated. Guests were dressed up and not. Couples posed and photos were snapped on the stage in the banquet room in front of a banner displaying the name of the bride and groom. An hour or so after we arrived, we were ushered into a small room with a few rows of folding chairs and a table at the front. Older family members (including us) got to sit while everyone else crowded into an anteroom. The groom and some sort of official stood by the table. Family chatted with them. Then someone flipped a switch for music I didn’t recognize, and a pair of small cousins scattered petals before the veiled bride, who entered on her father’s arm. Bridesmaids scurried to help glide the broad sweep of her beaded white dress and veil through the narrow aisle and then disappeared. During this and the rest of the short ceremony, there was lots of clapping, much of it coming from my husband, whose chief family role is fanning the “hot & noisy” festive atmosphere so desired at Chinese events. There was clapping at every stage of the ceremony: the rings, the paper signing, the kiss, the exit. According to Fred, the noise was requested by the official. Like everything else, that directive was in Cantonese, so I missed it. We missed a lot of the action as well because the bride and groom were seated at the table and there were six photographers with cameras and tripods blocking the view. They even stop-actioned the ceremony, asking the bride and groom to pause and smile and to repeat certain actions. At one point, a one-layer cake was brought in as a photo prop. And then we waited some more for our turn in the tea ceremony and while pictures were taken in every possible configuration of family and friends, small groups and large. The bride appeared several inches taller than usual, so I can only imagine how her feet must have felt after well over an hour of being a human centerpiece. And she was far from done. After the banquet started in earnest (three hours after we arrived), after the speeches, and the after groom had sung a karaoke tribute to his recently widowed father that made everyone teary, the bride reappeared in another gown (some Chinese brides change as many as 3 times during a wedding banquet). She got to sit during the videos of their respective childhoods and of the pre-wedding traditions where the groom and his party go to the wife’s family house to collect the bride, resplendent in her red cheongsam and gold bangles. She was up again for a karaoke number they sang together, and then they set off to make the customary rounds where the bridal party toasts each table of guests. 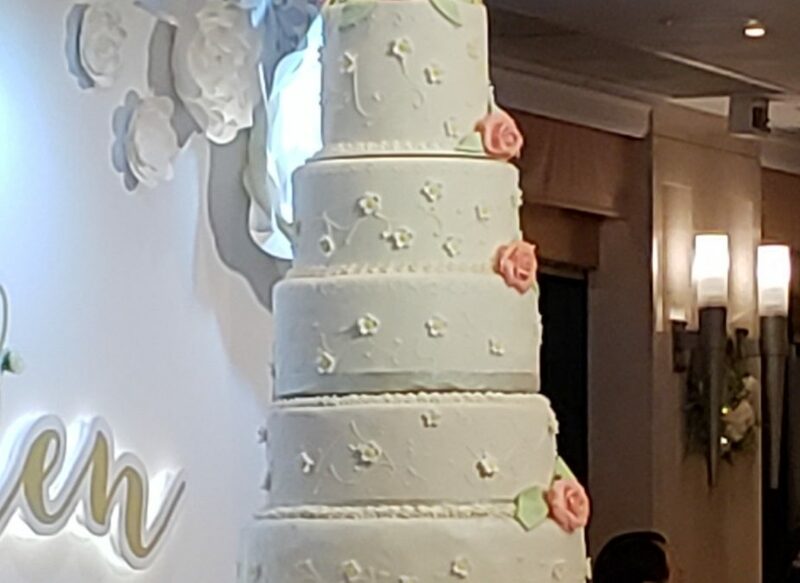 Somewhere in there, there were cake photos—with a multi-tiered plastic cake replete with a knife slot to make the cutting look authentic. The real cake, the one layer one that had appeared earlier, had been cut up and circulated as appetizers before the dinner. We stuffed ourselves on the requisite twelve courses and went home. When I went to my first Chinese wedding, all I could see was western trappings done wrong. Wedding photos before the wedding? Recorded music? Noise during the ceremony? No bridesmaids flanking the bride? A cake you can’t eat? (I’m a big fan of having my cake and eating it, but that’s another story.) Although I am still annoyed by photography so intrusive it obscures and mediates direct experience, I now see that the remarkable thing about Chinese weddings is their communalism. There is no pile of presents at a Chinese wedding because everyone gives money, the amount according to the relationship. The monetary gifts pay for the wedding so the family and the couple do not have to go into debt. In the pre-wedding ceremonies, the couple pours tea for their parents to honor them. In the tea ceremony after the vows, family members pass licee—red pockets with token amounts of money—to the bride and groom in exchange for cups of tea sweetened with red dates, honoring them as a couple. At the banquet, the bride and groom give heartfelt thank you speeches to their parents. Then they drink with each table of guests, thanking them for their presence and support. I love weddings so much that even fake weddings in movies and on TV can make me cry. Considering that I have had more than my share of them in my own episodic life, you might think I would be a cynic, and in some ways I am. Yet hope springs eternal, and weddings—especially in the face of modern divorce statistics—are as much about hope as any public ritual I can think of. In a way, all weddings are about forging a new relationship to one’s community as well as each other and about creating a family, whether for two or many more. By ritually reinforcing relationships, Chinese weddings buttress the hope that romantic love will last by underpinning it with the solidity of family and community. Even in the big city, it takes a village. NOTE: I have a chapter on my first Chinese wedding in my upcoming memoir. When Gary and I got married we confused both sets of relatives. We got married in the gamelan room at UHM, Shamoto sensei officiated, we were dressed in Javanese wedding clothing, had a Shinto ceremony with Riley Lee playing shakuhachi and then the gamelan played. It was a production. Top it off, the wedding feast was cooked by an exboyfriend’s now ex-wife. I love it–traditions way outside tradition!